A couple of weekends ago, inquisitive guitar girl invited people to come along to one of her first art exhibits. It wasn't exclusively her exhibit (there'll be one, but that's not for a while); she was one of several local artists who brought their stuff to be a part of a larger Waitangi Day (New Zealand holiday) festival. The festival is quite a distance from where I am, but I was staying with family that weekend who live closer to where the festival was being held. So, I selected 'Attending' on the Facebook invite, and told her I'd show up for a bit. 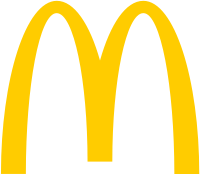 The festival itself wasn't huge (neither is the city it was held in, even by New Zealand standards), but it doesn't take a huge festival to draw in the fast food stalls and carts. Even small events manage to rope them in - I'm reminded of a hot-air balloon festival I went to around Easter last year which was pretty small, but the food carts all made an appearance: hot dog stands, hot chip stands (basically anything you can add tomato sauce to), hot drink and coffee carts (or anything that's best served at high temperatures), cold drink and ice cream stalls (OK, so there are some exceptions to these rules), and lots of candy stalls. Basically, if it can be served within minutes and doesn't reside anywhere near the bottom/healthy sections of the food pyramid, you will find a cart/stall for it. One cart at these events always catches my eye, and that's the Lil' Orbit donut cart. The donut cart occupies a very positive part of my memory; the section of childhood memories that is always seen through rose-tinted glasses and can't be sullied by things like time and outdated websites. A looong time ago, when my age could still be counted on one's fingers, shopping was one of the least-exciting activities you could subject me to. It meant being taken to several places for reasons I couldn't then understand, often resulting in not coming back with anything after hours of 'just looking'. Subjecting a child to hours of nothing leads to restlessness and whining. If one of the stores we frequented during these trips didn't have a display model Gameboy with Tetris running on it, I couldn't be held responsible for what damage I might have caused. 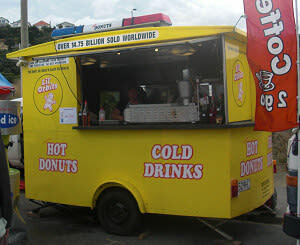 As a deterrent to bad behaviour from either my brother or I, my mum would reward us with donuts from the Lil' Orbit donut cart that was outside Deka (a department store chain in NZ that isn't around anymore) at the end of the shopping trips. Those donuts are probably the sweetest, fluffiest little treats I have ever had, and the taste is something that has imprinted itself on my senses since those days. Nowadays, when I see a donut cart and am feeling the need to satisfy my sweet tooth, I always end-up buying a bag of donuts for old times' sake. The same sort of phenomena as believing that your dad was really tall, or that the walk to school was really long: your sense of scale was very different then. I remember those donuts being large enough to hold in my hand. Now, they're about a quarter the size of my palm. 2. You never cared what it was that made something sweet, sweet. You just cared that it was sweet. Looking at the bag of donuts, I could see now why those things were so sweet: the donuts were thrown into a bag filled with brown sugar that clung to the donuts like a stubborn food stain on the crotch area of your pants. I found myself shaking some of the sugar off the donuts, just so I could tip the donut:sugar ratio in the donut's favour. So what did I learn about my childhood memories? That they lied to me? Sort of. If anything, I lied to myself, but only because at that age I didn't know any better. Regardless, I still find myself drawn to the donut cart: no matter how bad the company website is, no matter how much smaller those donuts seem to get, and no matter how much I learn about health and nutrition, I am willing to put up with crappy site design, tiny donuts, and bags full of sugar, to sample a taste of childhood.